A fantastic painting day with Kayleigh Ebenrick and Carolyn Norton! (See time-lapse video below.) 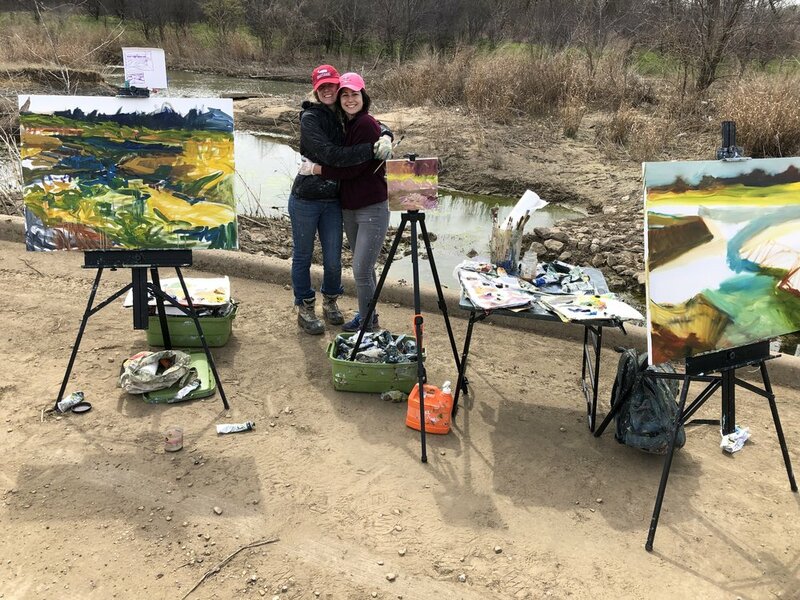 We painted at a wetlands site in Dallas, Texas. Our guest artist, Carolyn is from Mississippi and is a master print maker, photographer, and teacher with an array of expertise in the art world! She decided to branch out and join us for a day of plein air. I met her through a spontaneous and wonderful visit with Cate and Colby Howe. Carolyn’s critique and insights took us to a whole new level of viewing our body of work. Painting with a group of artists has many rewards...largely the camaraderie and sharing of technique and inspiration. I am SO grateful for these ladies and the joy they brought with their enthusiasm of art. After setting up about 30 minutes into the process we found out that the river was eroding the landscape and carving out the foundation from under the concrete road. You’ll see the inspector in the video come and measure the erosion. Hence “Painting on the Edge”. I look forward to more painting adventures with these two lovely ladies!